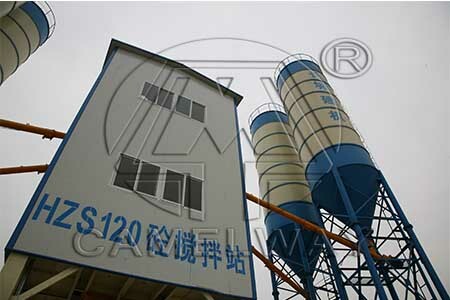 The accessory device is mainly composed of HZS120 type concrete mixing station mixing station, including the concrete mixer, batching plant with five warehouses, a cement tank, a fly ash cans of equipment, etc. According to the height of the unit, the weight of the parts, and overall dimensions, using a type of 70 t crane as dismantle lifting method; A 25 t truck crane to as a tool for demolition and equipment components transshipment. Then, we introduce the dismantling sequence to you. The preparation work before dismantling to cut off the power supply, to dismantle the pipe line of wind, water, electricity, admixture, cement, and fly ash, to remove the batcher, screw conveyor, cement tank and stents, to demolish hopper, aggregate weighing device, water weighing apparatus, powder weighing apparatus, admixtures weighing device, compressed air system device, to dismantle mixing layer platform and remove the lower column. Zhengzhou CamelWay Machinery manufacture is one of the large-scale enterprise specializing in construction machinery for several years. If you have any question, you can contact us. We will try our best to service for you.